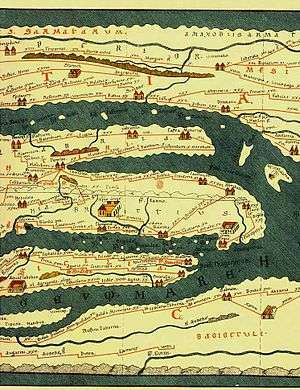 Tabula Peutingeriana (Southern Italy centered). An itinerarium (plural: itineraria) was an Ancient Roman road map in the form of a listing of cities, villages (vici) and other stops, with the intervening distances. One surviving example is the Peutinger Table (Tabula Peutingeriana); another is the Antonine Itinerary. The Romans and ancient travelers in general did not use maps. They may have existed as specialty items in some of the libraries, but they were hard to copy and were not in general use. On the Roman road system, however, the traveller needed some idea of where he was going, how to get there, and how long it would take. The itinerarium filled this need. In origin it was simply a list of cities along a road: "at their most basic, itineraria involve the transposition of information given on milestones, which were an integral feature of the major Roman roads, to a written script." It was only a short step from lists to a master list. To sort out the lists, the Romans drew diagrams of parallel lines showing the branches of the roads. Parts of these were copied and sold on the streets. The very best featured symbols for cities, way stations, water courses, and so on. The maps did not represent landforms but they served the purpose of a simple schematic diagram for the user. The Roman government from time to time undertook to produce a master itinerary of all Roman roads. Julius Caesar and Mark Antony commissioned the first known such effort in 44 BC. Zenodoxus, Theodotus, and Polyclitus, three Greek geographers, were hired to survey the system and compile a master itinerary. This task required over 25 years. The result was a stone engraved master itinerarium set up near the Pantheon, from which travelers and itinerary sellers could make copies. Archaeology has turned up some itinerary material in unexpected places. The Cups of Cadiz, four silver cups found by workmen excavating a foundation at Bracciano in 1852, are engraved with the names and distances of stations between Cadiz and Rome. The term itinerary changed meaning over the centuries. In the Itinerarium Burdigalense (Bordeaux Pilgrim, 333 AD), the itinerary is a description of what route to take to the Holy Land. The Itinerarium Alexandri is a list of the conquests of Alexander the Great. Today it means either a travel journal or a list of recommended stops. The term also refers to medieval guide-books written by travellers: most of these are accounts of pilgrimages to the Holy Land. ↑ Jaś Elsner, "The Itinerarium Burdigalense: politics and salvation in the geography of Constantine's Empire" The Journal of Roman Studies (2000), pp. 181–195, p. 184. ↑ Herbermann, Charles, ed. (1913). "Itineraria". Catholic Encyclopedia. New York: Robert Appleton Company.